Students stuff holiday gift bags to send to The Alliance Toy Drive for local children in need. Point Park's Honors Student Organization and the Honors Living and Learning Community are spreading holiday cheer to local children in need. The Honors Student Organization raised $250 and collected toys from the University community, and the Honors LLC purchased crayons, Play-Doh, cars, and other toys and treats to make 24 gift bags for the program's annual Alliance for Infants and Toddlers Holiday Toy Drive. "I am very pleased with this first community service endeavor of the Honors LLC," said Helen Fallon, professor of journalism and director of Point Park's Honors Program. "Great effort by a great group of students who made sure to give back to the community, which is so important this holiday season." The Alliance for Infants and Toddlers Holiday Toy Drive serves Allegheny County children who have developmental concerns, and many of their families have great financial need. The Honors Program has been conducting this drive for more than five years on campus. Justin Schilling, a junior sports, arts and entertainment management major and an Honors LLC community facilitator, helped to coordinate the toy drive. 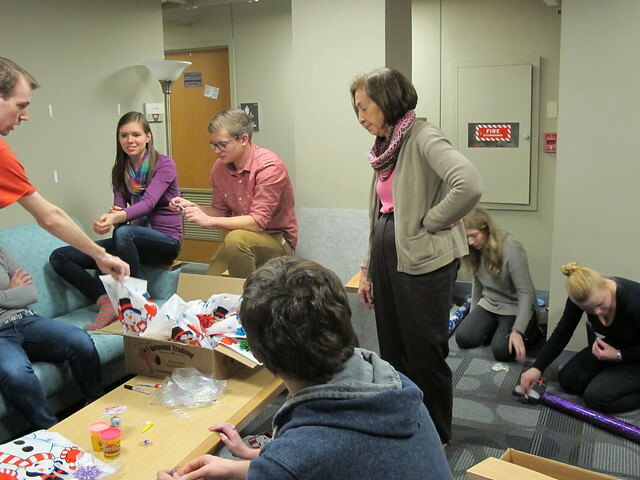 "My favorite memory was seeing the freshmen residents take time out of their busy schedules during finals week to put together the gift bags," said Schilling. "Everyone was very excited and happy to help!"